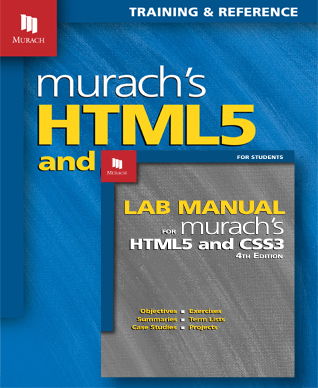 If you’re using Murach’s HTML5 and CSS3 (4th Edition) as a course text and your instructor has included the Lab Manual as a required component, you can buy eBook editions of both the text and manual from this page. You can also purchase the text and Lab Manual separately in print of eBook format. The text will help you learn how to create web pages the way today’s best professionals do. And long after the course is over, it will work as a time-saving reference for you. You may purchase this bundle if you’d like to get both components. But NO SOLUTIONS will be provided to the Lab Manual assignments.